The Nabla Powder Brush is perfect for applying your favourite powders: complexion powders, bronzers and illuminators! Made with ultra-soft synthetic hair, its tapered shape is ideal to quickly swipe off the excess powder applied to the skin. With the Nabla Vegan Close Up Powder Brush, your complexion is uniform, luminous and matte with a very natural finish! 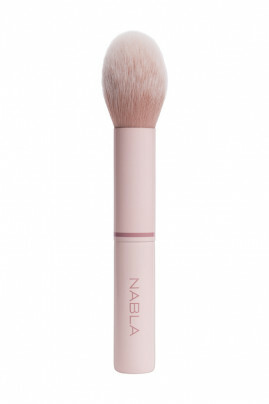 Nabla CLOSE UP Powder Brush applies all your powders! Take the compact powder with NABLA powder brush, then tap to remove the excess. Apply it all over the face from the inside out. Make circular movements for the mineral loose powder. Perfect for removing excess of Nabla Vegan Loose Powder, blend product from the inside out from the face.